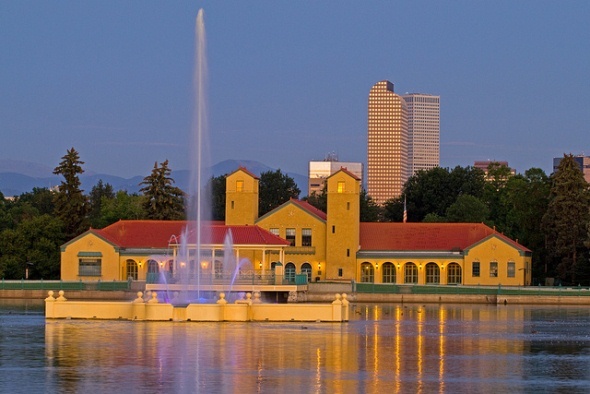 Denver’s City Park covers 320 acres in east-central Denver and features the Denver Zoo, the Denver Museum of Nature & Science, Ferril and Duck lakes, a historic pavilion, the greenhouse for Denver’s parks system, playgrounds, fountains, sports fields, tennis courts and picnic areas. Denver acquired the land from the state in 1878, and the initial layout was prepared by Henry Meryweather in 1882 in the style of 17th century English landscape parks, with an informal setting that featured a lake, gently rolling lawns and groves of trees. The zoo and Ferril Lake were added by 1900, followed by the Prismatic Electric Fountain in 1908 and the Italian renaissance-style City Park Pavilion on the west side of the lake in 1929. The Colorado Museum of Natural History, as it was then called, also opened in 1908. The park was originally a mile outside Denver, but the City Park neighborhood grew up nearby, with East High School opening in 1925. The Prismatic Electric Fountain was rebuilt in 2008 and continues to feature lights in the colors of the rainbow, resembling the effect of light passing through a prism. The center geyser was designed to shoot 90 feet into the sky, as the original did. The park also has H2Odyssey, a fountain where kids are encouraged to run through the water in the summer. Better yet, the fountain is interactive, with the geysers spouting water based on the movement of kids. The fountain was designed by Wet Design, which also is responsible for the Bellagio Resort & Casino’s dancing fountain in Las Vegas, and it was funded by $1.2 million from the Gates Foundation. It also is known as the Gates Interactive Fountain. The City Park Golf Course is north of the park.